Easterseals Academy empowers each student to achieve peak academic performance, increase social and vocational skills, develop an effective means of communication and foster the acquisition of functional life skills for independence in the community. Locations in Chicago, Machesney Park and Tinley Park. Provides a variety of resources for families who have a child with a developmental disability. Services can include social activities, respite, consultations, sibling support and a resource center. Located in Rockford. Inclusive early childhood and education services for children six weeks to five years. Located in Chicago. Early learning program nationally recognized for high quality, family-centered education for children ages birth to 5 years. Easterseals collaborates with 40+ early childhood programs located in the city of Chicago and suburban Cook County to promote school readiness in young children of all abilities from families with incomes below poverty guidelines. Offices located in Chicago and Hillside. Illinois Autism Partnership builds the capacity of school districts statewide so they may provide effective programming for students with an autism spectrum disorder. Our individualized coaching, consulting, family engagement and training programs offer school districts a wide-range of options. Supports children prenatal to three years old in Oak Park and River Forest through home visiting and group activities that help parents grow as their child’s first teacher. Located in Oak Park. Assists pregnant and parenting teenagers to develop and improve healthy parent/child relationships by providing long-term support through pregnancy, labor and delivery and becoming a new parent. Located in Rockford. 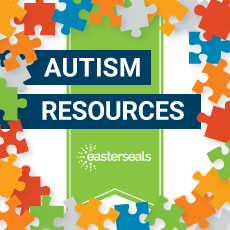 The Autism Program of Easterseals is a program providing evidence-based information and resources for autism spectrum disorder. The outreach program is for individuals living with an autism spectrum disorder and the families, caregivers and professionals who support them. Located in Rockford.